It is the choice for anyone wanting to use their SUP to stay in shape as well as ambitious recreational and touring paddlers. Like all other Kona inflatables it can be in inflated up to 25 psi making it extremely stiff and reliable. Cruiser 12’6 has an outstanding wide range of usability also making it a great choice for family activities. With the Cruiser’s generous length, it’s a great SUP to take your child or even the family dog with you! High end paddle for inflatable SUPs 3-piece Full Carbon Paddle, recommended for iSUP, adjustable between 178-210cm, suitable for paddlers 5'1'' - 6'5''. The paddle blades are constructed with a patented edge. The construction not only protects the board and the blade itself but also prolongs the lifetime of the paddle. 3-piece paddle is suitable for inflatable Stand Up Paddle Boards since it will fit into the same back pack as the board. Durable paddle for inflatable SUPs 3-piece Fiberglass Paddle, recommended for iSUP, adjustable between 178-210cm, suitable for paddlers 155-195cm (5'1'' - 6'5''). Upgrade to a backpack with wheels. The board, pump and paddle only weigh 15-16kg, so if you prefer to roll rather than carry, it's now possible to upgrade to roll with ease. 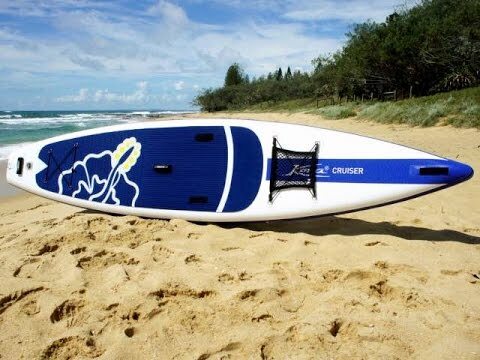 Cruiser 12’6 has become the favourite among many stand up fitness paddlers. It is the choice for anyone wanting to use their SUP to stay in shape as well as ambitious recreational and touring paddlers. Cruiser 12’6 has even proven to work as a stepping stone into racing. Like all other Kona inflatables it can be in inflated up to 25 psi making it extremely stiff and reliable. Cruiser 12’6 has an outstanding wide range of usability also making it a great choice for family activities. With the Cruiser’s generous length, it’s a great SUP to take your child or even the family dog with you! 2018 model year is built on the success of previous models and has been improved in every detail thanks to the new technology used which makes the board stiffer and lighter. Kona’s iSUPs are Swedish designed, encompassing durability and quality second to none. Stiffness and rigidity are huge factors in any board’s performance and inflatable paddleboards are no exception! Kona’s multi-layer and double-wall technology, together with machine based V-drop stitch core, result in Kona boards being at least 20 percent stiffer, more robust and lighter than boards produced by other manufacturing processes. Quality tested for inflating up to 25PSI (air pressure), you are guaranteed an extremely stiff board and reliable ride. An all machine-based gluing process also ensures an excellent surface finish. Kona’s unique graphic designs beautifully capture the Kona flower, creating boards that any rider would be proud to be seen on.